The Hamilton01493 844662work Group AccommodationThe Hamilton, Great Yarmouth is pleased to welcome staying groups and provides a range of group friendly rates/incentives to enhance your break. 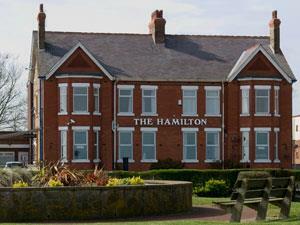 The Hamilton is open all year and is ideally situated on the seafront overlooking the beach and Venetian Waterways. The Hamilton welcomes group bookings looking for that special break. The Hamilton is just a pleasant stroll to all of the shows, tourist attractions and the shopping centre. We offer a relaxed family run environment where our personal attention ensures everyone has a most enjoyable stay. The Hamilton, Great Yarmouth is pleased to welcome staying groups and provides a range of group friendly rates/incentives to enhance your break.